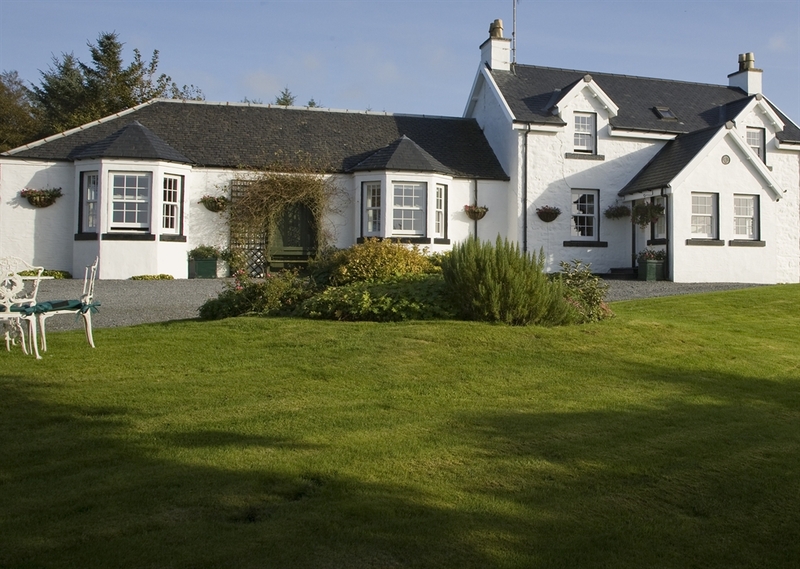 Kilmeny :: Islay Kilmeny sits in the centre of the family's 300 acre beef and sheep farm in the heartlands of Islay, commanding elevated views over the surrounding countryside. For over 40 years Blair and Margaret have been welcoming guests into their 19th century farmhouse, offering them comfort, friendliness and peace, albeit with a little added luxury. Kilmeny is non-smoking and is pleased to offer 5 Star Accommodation and Breakfast. FIVE STAR QUALITY on an Island Destination. Four, well-appointed bedrooms and a self-contained suite, each of individual character and decor all have full en-suite facilities including both bath and shower. Thoughtful touches include brightly lit mirrors, convenient shaving sockets, plenty of thick soft towels and shining ceramic tiles. Each bedroom has tea and coffee tray complete with home-made biscuits, an iron and ironing board, a slient fridge with a little jug of fresh milk, an ice compartment, shoe cleaning box, hairdryer and other little touches like padded coat hangers to make you feel at home. The Yellow, ground floor, twin-bedded room is bright and sunny. A spacious luggage cupboard provides storage for your suitcases and houses a fridge stocked with fresh milk to complete your hospitality tray. Bay windows, with conveniently placed easy chairs, allows you to enjoy the panoramic view of hills and glen. The ensuite bathroom has both roll top bath, large walk in shower & television at the end of the bath offers a little added luxury. The Apricot room on the first floor has a pocket sprung king-size bed. Although not so large as the other rooms this bedroom benefits from having a walk in wardrobe and luggage store, leaving the rest of the room with free space. Its elevated position with views of hills and glen is part of the reason why this rooms remains a favourite with returning guests. A silent integrated fridge stocked daily with fresh milk completes the hospitality tray. The en-suite bathroom has both bath and shower. 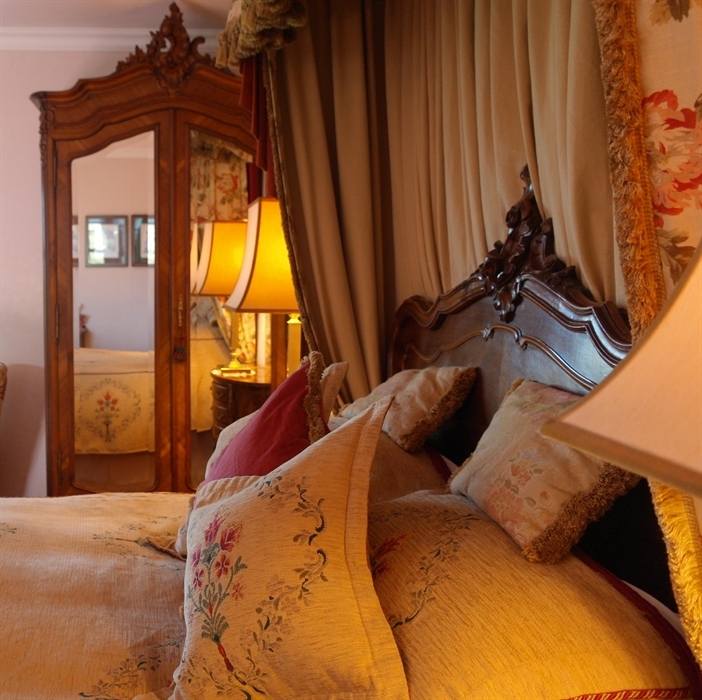 The Rose Room is a spacious ground floor bedroom with king-size bed. French Doors lead out on to a small sheltered garden and bay windows offer views to the surrounding countryside. Large easy chairs and binoculars provide the perfect place to relax and enjoy the views. The rose room has an integrated fridge stocked daily with fresh milk to complete your hospitality tray. The en-suite bathroom has a roll-top bath and a large walk-in shower. A television at the end of the bath offers a little added luxury. 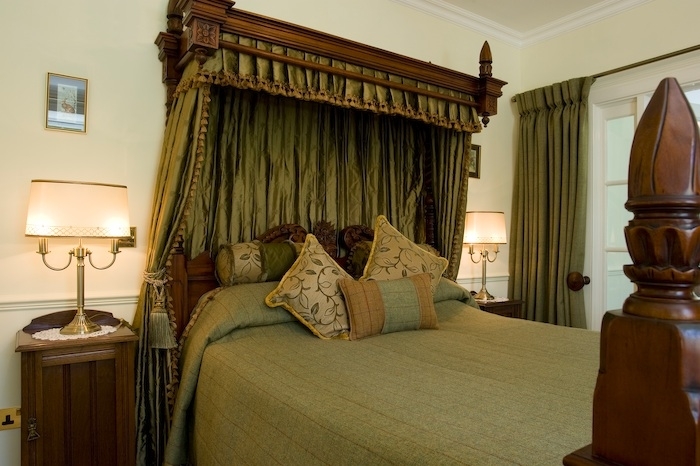 The Gold room, on the first floor, is a spacious double room with an extra-large king size bed. This is a traditional bedroom with partly combed ceilings and double aspect. There is a separate walk-in wardrobe and luggage store. The sitting area of this room is spacious with several large easy chairs. An integrated fridge stocked with fresh milk completes your hospitality tray. The en-suite bathroom has both roll-top bath and separate walk-in shower. With private access, the Suite provides a little extra luxury. On entrance there is a small sitting room with kitchen area. The soft furnishing fabrics of the Suite all come from the local Woollen Mill just four miles away. Continue through to the bedroom with a four posted king-size bed. Antique furniture, a walk-in wardrobe and luggage store, all add to the sense of space in this room. An extra-large walk-in shower, roll-top bath and twin counter-top basins complete this luxury bathroom. Eggs Florentine; Roasted Tomatoes stuffed with Haggis; Poached fillet of pale smoked haddock; Scottish Pancake Stack with Banana and Maple Syrup; Smoked Argyll Salmon with Scrambled Eggs; or A Cheese Platter. All rates include breakfast and afternoon tea tray on arrival. We recognise that, on occasions, guests will book accommodation and subsequently find that they are unable to travel. In these situations we ask that guests please notify us of their need to cancel as soon as possible. We would respectfully remind you that a reservation constitutes a binding contract. The deposit is a payment made to us to keep a room available for you (turning away all other bookings) for the nights requested, and is not refundable if you cancel for any reason. Should you cancel within fourteen days prior to arrival, we will make every effort to re-let your room (which may not be possible due to available ferry space at that time). If we are unsuccessful in doing so, you will be liable for the full cost of the reserved stay. You are therefore strongly recommended to take out appropriate insurance for your protection. The dates on which you may wish to stay. The number of persons in your party. The type of accommodation you would prefer. Any other relevant information regarding your proposed visit. PLEASE NOTE: PLEASE DO NOT RELY ON SATELLITE NAVIGATION WHEN TRAVELLING TO ISLAY, AS IT WILL OFTEN GIVE POOR ROUTE OPTIONS. THIS IS ESPECIALLY TRUE ON ISLAY, WHERE SEVERAL RURAL PROPERTIES SHARE THE SAME POSTCODE. From the Erskine Bridge, whether crossing over from the M8 or passing by on the A82, the journey to the Ferry Terminal at Kennacraig should take between two to three hours, depending on road conditions. Once on the A82, follow it along the edge of Loch Lomond to Tarbet, take the A83 through Arrochar, over the 'Rest and be Thankful', on to Inveraray and down Loch Fyne, passing Lochgilphead and Tarbert. Five miles (8km) south of Tarbert is the Ferry Terminal at Kennacraig. From Glasgow, using Loganair's twice daily flight. For bookings, times etc., Tel/Fax Port Ellen Airport: 44 (0)1496 302022 or Loganair reservations 0344 800 2855. Book online at loganair.co.uk Car hire can be arranged for pickup at the airport. See our website for detailed directions from your port of arrival to Kilmeny. See what our guests have to say and read our reviews on TripAdvisor.